It’s wordplay. Hooray! 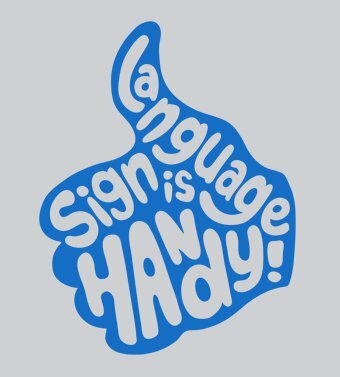 Sign language sure is handy in that you use your hands, and let me tell you, this design’s humor goes even deeper, because if you’re deaf or want to communicate with someone that can’t hear, sign language comes in very handy. Double meaning. Right here! Right now! Plus, look at the design. In harkens back to late 60s poster art, which was the golden age of poster art, except for maybe like the 1850s in France.